IT is contempt of Court for United Party for National Development (UPND) leader Hakainde Hichilema to demand for the release of his supporters who are facing a serious case of aggravated robbery, Patriotic Front Lusaka Province (PF) youth chairperson Kennedy Kamba has charged. 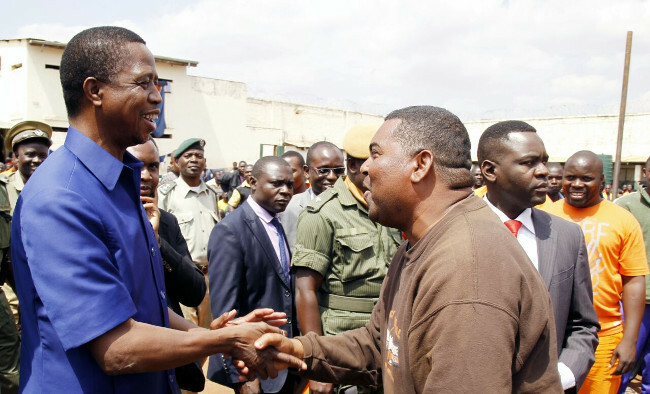 Speaking after visiting former Kafue Member of Parliament Obvious Mwaliteta and other UPND officials who incarcerated at Chimbokaila prison yesterday, Mr. Hichilema demanded for their release, saying they were not criminals but citizens who were fighting for their rights. Mr. Hichilema said his party would never give up but would continue to fight for its freedom and described the incarcerated Officials as “political prisoners” and that the party had gone to encourage them to remain strong because their freedoms would be secured soon. But Mr. Kamba said Mr. Hichilema’s demand amounted to contempt of the court because there was no one else with the mandate to decide cases apart from the courts of law and that his statement was aimed at intimidating the judiciary and should not be tolerated. He said it was important for politicians to realise that they were not above the law and that any manoeuvres to influence the outcome of the cases before the courts of law should be treated as prejudicial and that those who were at the helm of making unwarranted statements against the judiciary should be cited for contempt. He accused Mr. Hichilema of not having respect for the judiciary as he had repeatedly spoken ill of the judges in matters he wanted to have an upper hand in order to influence them to make decisions which were in his favour. “Mr. Hichilema should be cited for contempt of court because he knows so well that the cases of his members who have been arrested are still in court and are yet to be concluded but he has continued to make running commentaries on them with reckless disregard of the law because he has no power to demand for the release of anyone. “As PF youths in Lusaka, we will not accept any intimidation of the judges, prison warders, or police officers because these are just discharging their duties according to the law and so, no one should drag them in their personal battles and we will not accept any manipulation of the outcome of cases in court because we respect the rule of law and we have respect for and confidence in the judiciary in this country,” Mr. Kamba said. Mr. Mwaliteta is one of the UPND officials who were arrested during the election period and charged with a non-bailable offence of aggravated robbery after they impounded a vehicle belonging to the Electoral Commission of Zambia (ECZ) on suspicion of carrying pre-marked ballot papers aimed at rigging the election. Kamba, you’re overworking yourself in your quest to be noticed by HEEL. Those are trivial issues. There are far more important issues that the PF should channel their energies on. Mamba never got any ministerial appointment, his Kabushiki fellow thug MMD diehard, can’t remember his name, was appointed as minister of copper belt to control the Method. Mamba fight within PF, MMD has taken over, HH has better fights. Even fools wants to be noticed …? This is too much from this unprincipled man. The problem is that he thinks he is a president who is above the law. This is total madness and bitterness. Are we ever going to work properly or drink some water to refresh. Now he is supporting criminals – ati fighting for their rights – kwisa. Is there any rights in thuggery and criminality. This man is really confused. I think the lose has really hit him hard. He could have borrowed too much for his campaigns and the owners of he money are on his under spheres. All the criminality is with PF. Serious cases of assult on UPND members are recorded yet no one is arrested. Indeed they are political prisoners. They wanted to prevent rigging but were arrested on tramped up charges. In all fairness could you imagine mwaliteta comminting such a felony. That’s absurd. Look at Max Chongo who even exchanged gun fire with police in Eastern province, just went with a slap on his wrist. Political prisoners are prisoners of conscious and must be released forth with. Kamba let’s not kill a dead person. HH can bay at the moon but the moon won’t come down. He’s just putting up some bravado to show his followers that he hasn’t neglected them. In short apart from the billion dollars that he has, he’s as helpless on this matter as a vendor on Cairo Road. @AZ trying to get election material is not a heroic feat but a criminal action. Maybe in Upnd criminals are heroes, but let’s limit it within the party. Next is GBM for assault. The long arm of the law will catch up with HH. He will luck out. Right now he is feeling low and hitting out in bitterness. Let’s hope he calms down soon. Kamba is correct. I would say that ‘inciting’ comments forcing an opinion on the public contrary to Judicial decision is undermining our legal system. HH is skating on thin ice. Kamba the president has no confidence in you look at how quickly friend from MMD Lusambo has risen. please make yourself relevant and don’t politic anyhow….politics ni timing mwana. you keep on mixing with fools like max look at you now the president has not given any position. wake up my friend and ditch people like max!!!!!!!!!!!!!!!!!!! It is really sad for the Highest Court in the Zambia to be accused of Human Rights Violations. Such acts touch on the lives of the entire Zambian population and can only be effectively dealt with by an international criminal tribunal or the ICC. Let us forge ahead and work hard for our country&families.one zambia one nation&rule of law very important.justice&no room for crimality. Mr. Hichilema is an ordinary businessman just like any one at chisokone market. He has no idea on how the law works. so let us forgive him. He relies on Mather who is also not very good in law. Lungu is the president of Zambia as at now.